Well then, a point apiece in the north London derby and that's a wrap from us for the evening. Spurs goalscorer Harry Kane tells BBC Sport: "We played very well. Even in the second half we had our chances to kill it off, but if you don’t kill top teams off they come back at you. There was talk about whether we'd have enough energy and I thought we showed we did." On Dele Alli: "He's a great, great talent. It doesn't matter what stage he's on, he'll try things and try to express himself, which is great for Spurs and great for the country." Who gets your vote?Image caption: Who gets your vote? It's that time of the month again - time for you to choose goal of the month. There are eight Premier League goals up for your consideration - vote here. Missed anything in the FA Cup this weekend? Arsenal boss Arsene Wenger: "In the second half we showed the mental strength of a side determined not to lose the game. In the end I think it’s a good 1-1. "Kieran Gibbs' movement is good. His timing in the box is good. Sometimes when he gets into a position he doesn't believe he can score. "What this championship shows is that you have to fight 200% in every game for a result, you've seen that in all the games today. It shows it will be down to the team that can find the mental resource in every game." Tottenham boss Mauricio Pochettino tells BBC Sport: "The way we played we should feel very proud. The effort was brilliant. The level we showed and the commitment was fantastic. It’s the way we want to carry on. "In six days we've played three matches, maybe we felt it in the final minutes. We need to recognise we are a very young team. This experience is very important. "We need to show we are maturing. The level we have today is good, we need to show more and to improve. It's early to set a limit or to expect a lot of things." Harry Kane has scored 10 goals in 13 Premier League London derbies. The England forward has scored five goals in his last three Premier League games. He also has 22 Premier League goals in 2015, four more than any other player in the competition. Who put a shift in? Danny Charity: If that match taught us anything, it's that Arsenal will never be serious title challengers with Giroud as main striker. Arsenal boss Arsene Wenger tells Sky Sports: "Tottenham bossed the first half, Santi Cazorla was not at the races. We had restricted options on the bench. "I must give credit to players, they refused to lose the game. "We now gain two weeks' treatment for 10 players who are not available and I hope that we do not lose more." That is a strange one. Surely if Santi Cazorla was not feeling well he should have told the bench? Arsenal boss Arsene Wenger: "The game could have gone both ways. We were a bit unlucky as well because we played the first half with Santi Cazorla who was half conscious. "I changed him at half-time. I don’t know what happened to him. He felt perfectly alright earlier, but when we went to go back out they said he felt dizzy." Arsene Wenger says that every game in the Premier League goes to the wire and that Santi Cazorla was feeling dizzy during the first half. Spurs midfielder Dele Alli on Sky Sports: "The boys will be disappointed. We feel we've dominated most of the game. To be disappointed shows how far we've come." Tottenham manager Mauricio Pochettino: "Yes we should have won but I feel very proud of the players. We played very well. You need to kill the game. When we were 1-0 up we had chances to score again. "We played three matches in six days and had one day less to recover but we showed great character and personality. "We need to carry on in the same philosophy. But we are 11 games unbeaten and I can feel hugely proud. The progress we are making is correct." Arsenal goalscorer Kieran Gibbs on Sky Sports: "Goals don't come often for me but when they do hopefully it's enough to help the team. We know what the game means to everyone. We're struggling with injuries at the moment, players were tired from midweek. Obviously it's disappointing to drop points, especially when we're in such a strong position in the league." Moyes on his way out? If you haven't read this excellent piece from Andy West on the future of David Moyes, it may be worth giving it a read now. We hear that Moyes is set to lose his job. Spurs goalscorer Harry Kane on Sky Sports: "I thought we played well. It was end to end and an open game. Credit to Arsenal, they kept coming and got their goal. We've had a tough week and put in a great shift and good performance." The dreaded international break is set to send the tumbleweeds across the Premier League tundra for the next fortnight but who is up next for these two? Arsenal restart at West Brom on Saturday 21 November, and Spurs play West Ham on the Sunday afternoon. Over at Anfield it's another cracking away day for Crystal Palace as Pards outfoxes Klopp. Follow the reaction from Anfield here. "Kyle Walker's had a great game and not done much wrong. Harry Kane has been isolated but comes away with a goal and will start for England against Spain. For Arsenal, Olivier Giroud has been a big target, Mesut Ozil is close to being back to his best. It's been a really great game. "Arsenal had to do something to get back into the game. Spurs looked a threat in the second half, but I think a draw was probably about right." No wins for Arsenal or Manchester City means that it's a good day for Leicester and Manchester United at the top of the table. All over! A good point for Arsenal as they looked like being swamped for a period of time in the second half, a good result for Spurs as it keeps their long unbeaten run going. Arsenal have been well no top but there's a glimmer of a chance for Spurs as Harry Kane spins away from a tired challenge and shoots wide on his left foot. A complete momentum change in this game, now it's Arsenal who look like winning it. Into the final five. Into the last few minutes, Hugo Lloris punches away a corner and then it's helped back in, Olivier Giroud wins yet another header but Lloris is able to make the save! "This is the best I've seen the atmosphere here for a long time. The Arsenal fans have stayed with their team. It's a brilliant atmosphere." Ryan Mason is on for the final 10 minutes, replacing Dele Alli in midfield. Spurs will kick themselves if they don't win this. He's in there again Kieran Gibbs! Per Mertesacker flicks on a corner and he's almost there at the far post again but this time Hugo Lloris shovels it away. From the corner Olivier Giroud batters a shot on the bounce over the top. "He's in there. Kieran Gibbs has come on as a substitute and he's there where it counts, making a nuisance of himself. He got it on target which is the one thing you need to do - he gets his reward." Kieran Gibbs can add an attacking threat! But it's poor from the usually reliable Hugo Lloris. Mesut Ozil stands up a cross to the far post, Gibbs is behind Kyle Walker to get a shot in on goal, down into the turf and Lloris should save that but it bounces past him and in. Not sure Arsenal deserve that but they'll take it! And now a switch for Spurs. Erik 'walking red card' Lamela is withdrawn and Son Heung-min takes his place in the Tottenham attack. Joel Campbell is off for Arsenal and Kieran Gibbs is on. Can the left-back provide some attacking threat? Harry Kane now hits a low, bobbling strike from 22 yards and it flies just past the far corner! Tottenham should be home and hosed. Will they regret those missed chances inside the final 20 minutes? Arsenal look tired now. You try chasing Bayern Munich around the park for 90 minutes a few days before a derby with your biggest rivals. Harry Kane's eyes light up for number two but his header is turned over, and then from the corner Petr Cech has to make a flying save to keep out a Toby Alderweireld header! "Every time Spurs go forward they look like they can score. Erik Lamela, Christan Eriksen, Harry Kane - all finding space. The Arsenal defence has to be tighter." Don't blame me! Sir Les or Big Dunc would have scored twice since half-time. Fact. Instead it's Tottenham who look the more dangerous still. Kyle Walker has the legs on this Arsenal team and gets down the right again, this time he has the ability to pick out Christian Eriksen in the box, his first-time shot is heading in until Petr Cech claws it away. Seconds later Harry Kane is slid in behind the line and drags a great chance wide. "Olivier Giroud won't have a better opportunity to score all season. He does everything right really and it just goes past the far post. People will say he should have scored it - but he's unlucky for the ball not to roll in." As it stands Spurs will be just three points off top. It's been a bad Sunday for Arsenal and Manchester City up there. Well he really, really has to score that one! Corner from the right, Olivier Giroud unmarked six yards out, he heads it a yard wide. Bury that one! Olivier Giroud (number 12) has got to score from there, hasn't he? All aboard the Dele Alli bandwagon! Roy Hodgson is in the stands, he's a fan and has picked the teenager for his current England squad. Alli has been immense today, no doubt about that. "What a player Dele Alli is. He has controlled the play and made good use of the ball. He looks a good athlete." Maybe it's the change in shorts that have motivated Alli?Image caption: Maybe it's the change in shorts that have motivated Alli? Got to score that! Big chance for that man in the air, Olivier Giroud gets away from his marker to meet a free-kick, and he heads against the crossbar from five yards out! Top save! Hugo Lloris makes a big one-handed stop to push out a low shot from Joel Campbell after the Arsenal man cut onto his left foot. If you missed the day's early game, Remi Garde got his Aston Villa career off to a good start with a 0-0 draw against Manchester City. And in the other 16:00 GMT kick-off it's Liverpool 1-1 Crystal Palace at the break. Goodness sake Arsenal fans get behind your team. You are joint top of the league coming into this game. Spurs score 1 goal and suddenly lets spend £100M. "This is a very capable Tottenham side. They have good legs in the middle of the park and the two Belgian centre backs who have excelled. They have clever players and flair. They've done well and impressed me. "It's a deserved lead. They've been assured and comfortable at the back. I expect Arsenal to be more positive and to have more efforts on goal in the second half." "It's one of the most accomplished 45 minutes from Spurs I've seen. It's no secret that Tottenham play a high pressing game but this is a very mature performance from Mauricio Pochettino's side." Harry Kane is the half-time difference maker at the Emirates. Almost half time and Arsenal are fading fast. Big changes needed. Neymar has just scored an absolute gem of a goal for Barcelona. Jamie Vardy-esque. Spurs looking good as we approach half-time, but they've twice led in the derby at the Emirates in recent years and gone on to lose. Arsene Wenger will not be happy with his team's showing though. Very flat. Better from Arsenal, as they have their first effort of the day, Alexis Sanchez trying a backheel from Joel Campbell's low driven cross but it's easy for Hugo Lloris. Before today the longest they had gone this season without a shot on goal was eight minutes. Here's that Harry Kane goal in graphical form. Perhaps the most impressive feature was the second he gave himself to compose before slotting home. That can be seen in the dotted line in front of the number 10. "What a ball in from Danny Rose. Where Per Mertesacker is I don't know - he had to get across. Harry Kane is left one-on-one an it's a beautiful finish. He hits it into the ground and it bounces over Petr Cech." That's five in his last three league starts for Harry Kane after his slow start to the season. You could see the confidence back in him as he waited to take that chance. Clinical. Absolutely clinical! Danny Rose plays a clever ball over the top, Laurent Koscielny steps up to play offside and Harry Kane is away and onside. Kane has a lot of time, but he uses it really well. Delays the shot, waits for Petr Cech to move and just glides the shot across the keeper and in. Arsenal are yet to have a shot on goal. Spurs now having a lengthy spell of possession, slowing the game down. They work it well too, waiting for Kyle Walker to join in and cross, it goes all the way through to Danny Rose but his shot over the top is poor. Erik Lamela is then almost in but Nacho Monreal reads it well to cut it out. The visitors look dangerous! "What a chance for Eric Dier. A free header at the back post. He's totally unmarked. He's only got to put it on target, but it's come off the side of his head." Harry Kane's touch map suggests he might need to be more disciplined in the positions he takes up? All over the place at the moment. He's got Rooneyitis. We have had a goal at Anfield so it won't be a totally goalless day. Can we get a breakthrough at the Emirates? Oooh that is close! Eric Dier is left free at the back post and he heads wide! "It looks a bit worse than it actually is. Saying that if the linesman sees it, he might have done something about it. I don't think it was malicious." Joel Campbell is in the news again, he sticks out an arm to stop Danny Rose overlap him and catches the left-back in the face. He's lucky to escape a card there. Game getting a bit tetchy. Spurs have a rare attack and it ends with a shot from Mousa Dembele which is deflected wide. Two in two for the Belgian, he smells goals. Mesut Ozil gets hit by a coin from the away end as he prepares to take a corner and for a minute I thought he was going to chuck it back. Thankfully Ozil discarded the coin off the pitch instead. Nobody needs to see that. Nearly nice! Joel Campbell leads a charge through the middle, he finds Mesut Ozil on the left, he tries to find Alexis Sanchez but his touch gets away from him. Jonathan Pearce gives the counter attack 6/10. Fair. Does this average position graphic suggest Arsenal are too isolated from each other? Or that Tottenham need to spread out? "Arsenal are playing all the football but Spurs are looking dangerous on the counter. "I'm surprised by Joel Campbell - he's very slight but is so strong. It's difficult to push him off the ball." People may try and tell you that the Premier League is no longer the best league in the world but where else would you get Joel Campbell v Danny Rose in a clash of two of the top five? Campbell, easily in the top three Campbells to play for Arsenal in the Premier League, runs it out of play. No chances of note as yet. No goals in the Premier League today and it's almost dark. Come on! Joel Campbell keeps the width out right for Arsenal and is almost in when Alexis Sanchez plays a cute pass through, he runs out of room though. It's all 100mph stuff so far. "After losing 5-1 to Bayern Munich there is no better game for Arsenal to get that out of their system than a North London derby. But Spurs look a very capable side on paper. "This has started at a ferocious pace. It's remarkable. Can somebody kick the ball out of play so we can have a breather?" The Premier League in microcosm. High-speed, high-tempo, low in quality. First Tottenham break clear after a turnover, Kyle Walker provides the width, the ball comes over but it breaks down. Cue Arsenal break, same story, men flying forwards, an overlap is on but the final pass is poor again. Christian Eriksen starts out on the left for Spurs, is that a waste? I'd have him in the number 10 role personally. But what do I know. Maybe Tottenham don't rate Joel Campbell when it comes to tracking back. The Costa Rican is on the right for the Gunners. Cracking minute's silence. Now it's game time. Members of the Royal Artillery, one Spurs fan and one Arsenal fan, carry a wreath to the centre circle in a particularly well-done remembrance day moment. The ode to rememberance is read out, followed by the last post. Liverpool and Crystal Palace fans looking for a live text commentary on their game are in luck - it's over here. Here we go then, a noisy Emirates awaits as the players gather in the tunnel. No honestly! Everyone loves a big targetman don't they? I'd forgotten all about Brian McBride. Henrik Larsson scored amazing headers on a weekly basis. Two against Porto in the 2003 UEFA Cup final are perfect examples! Brian McBride, definitely. That man could head a ball with such power and precision! Tottenham manager Mauricio Pochettino: "We played Monday, Thursday and now so it has been a very busy week. It has been difficult to recover for the players. "You never know how the opponent is but for us it is a derby, it is a very important game. We know what it means to us and our supporters. "We must forget the past record for us here, just focus on today. It will be a tough game, Arsenal have unbelievable players but we have trust in ourselves." James McNair: Best header of a ball I think I've seen is probably Martin Chivers. On Tottenham's run of one win in 25 at Arsenal: "That record is nothing but embarrassing. It's absolutely shocking. If you're a Tottenham player, you're wanting to put that right. That is nowhere near good enough. It's just a shocking record, hence Arsenal always finishing above Spurs in the table." Arsenal boss Arsene Wenger on Sky Sports: "I hope the players have recovered from Munich but it was intense physically. "You always want to respond to a disappointing result, we have conceded five goals, we accept that and now we must respond. Overall we have a good defensive record. "Is this one of the best Tottenham sides I have faced? I will tell you after the game. They look very well balanced and can hurt you on the counter attack." He's in and out of favour like Donald Trump but since debuting in August 2012, Olivier Giroud has scored the most headed goals in the Premier League (15). But, quite simply, who is the best header of a football you've ever seen? At whatever level you like, schoolboy stuff to World Cups, nominations please for the best man in the air you can recall. Send us your suggestions to81111(UK Only, with your name on it), or tweet us at#bbcfootball. Arsenal go again with Joel Campbell in the three behind striker Olivier Giroud, can he step up? While Tottenham have potential England midfield axis Eric Dier and Dele Alli patrolling the centre of the park. "Arsenal were lucky to only lose 5-1 to Bayern. The Gunners were so poor defensively and there was no midfield cover - the final score could have been anything. "This will be a lot tighter - there is no way Arsenal will be so open again and Tottenham are likely to put their defence first." Hugo Loris and Petr Cech are out going through their warm-ups at opposite ends of the ground, there aren't many keepers better than those two in the top flight. Will either leave with a clean sheet this afternoon? "The question for Tottenham every year seems to be: can they make the top four? The answer is usually 'no'. "This season, with Manchester United not playing brilliantly and Chelsea well below their usual standards, there is a massive chance for them. "Sunday's north London derby at Arsenal will be a huge test of where Spurs are at, especially because they have been battered at Emirates Stadium a couple of times in the past few years." Spurs have not won there since November 2010, when we came back to win 3-2 in a game I played in. We had a decent record against them at that time, and had come back to draw 4-4 the season before. "Tottenham are quietly going about their business which is credit to the manager. With the way Chelsea are playing, Tottenham will be one of the favourites for a Champions League place." Arsenal make just one change from the team thumped by Bayern Munich in midweek but it could be a key one as Laurent Koscielny returns at centre-back in place of Gabriel. The pitch at the Emirates is an absolute carpet. I'm hoping for a feast of Sunday afternoon football. Serve me up. 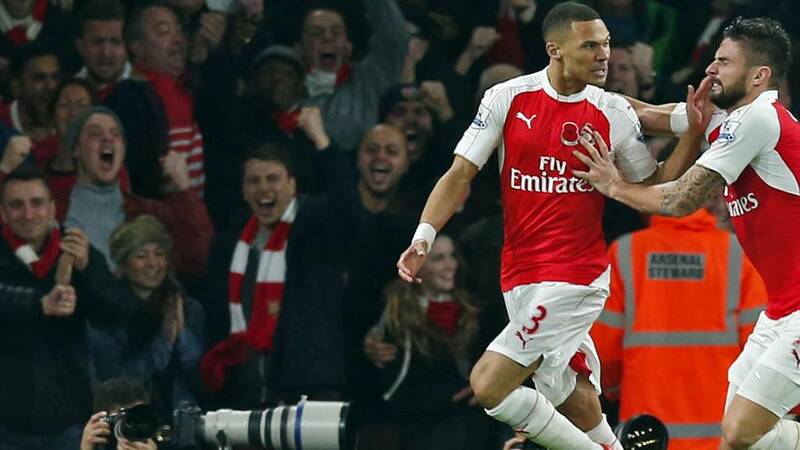 "North London derbies after Arsenal versus Bayern encounters have become common. In 2014 the Gunners won at Spurs after a morale-boosting, if futile, draw in Munich. "But the home humbling by the Germans in February 2013 left them so befuddled they lost at Tottenham 12 days later. "If they're to hold their season together they can't afford to let the auld enemy go away with just a second victory from 26 visits. "Injuries to Theo Walcott and Alex Oxlade-Chamberlain have blunted Arsenal's pace, and they can't defend without Laurent Koscielny - so will be relieved the Frenchman is expected to be fit. "Tottenham are in the mood after three victories on the spin. I can see a high-scoring draw." "I want to say that before a ball was kicked I predicted Arsenal to win the league. One of the biggest things for Arsenal was dropping Petr Cech in the Champions League and now it looks like they won’t qualify." Spurs make just three changes from the side who started against Anderlecht in Europa League. In come Kyle Walker, Danny Rose and Mousa Dembele. "Harry Kane is a man who always puts himself in the best position to get a shot away at goal. As a goalscorer, even if you have a lean spell you never lose it." If Arsenal have injury problems, imagine having to play without Lionel Messi. Mind you, Barca have done ok in his absence to be fair. You can follow their latest attempt to play without the great one here. There are 10 FA Cup first-round ties taking part this afternoon and you can see all the goals as they go in in this sparkly magic FA Cup page here. As well as my wonderful prose and your superb comments, you can follow full radio commentary of this derby on BBC Radio 5 live. Tune in. On Tottenham's run of one win in 25 at Arsenal: "Stats don't worry me too much. It's Arsenal v Tottenham but it's different players. It's down to those 11 players on the day. I don't think they sit in the dressing room before the game and think 'we haven't won here in however long'." "Arsenal look so strong - their squad is strong, as is their bench. This season is one of the best chances they have had in years of winning the title." Spurs meanwhile have only lost once in the Premier League all season, and a win at the home of the old enemy this afternoon could see them move into fifth place. Is Champions League football on its way back to the Lane? Arsenal come into the north London derby with that massive injury list and on the back of an absolute trousering in Munich. "At the moment we have too many players out. "I am very concerned, honestly, because we are only in November and we have so many players out knowing we go into the Christmas period soon." Arsenal are going into a key stage of the season with an injury list longer than a seven-year-old's Christmas shopping list. Jack Wilshere is out, Theo Walcott is injured, Aaron Ramsey is out, the Ox is out - even Tomas Rosicky is missing. All we need is Abou Diaby to complete the top trumps set.